Located about 8 miles from Hexham.This 14th-century castle offers magnificent comfort, set in a 12-acre woodland estate. Many rooms have luxury features such as four-poster beds and window seats. Langley Castle is perfect for discovering Hadrian's Wall and other attractions local to Langley. With 7-foot (2.1-metre) thick walls, this exclusive castle is a quiet and unique destination in which to be pampered. Enjoy a candlelit dinner in Josephine's Restaurant (2 AA Rosettes), serving regional produce, seasonal fish and local game. For a drink, the superb drawing room has stained-glass windows and a log fire. Winner of the One North East tourism awards for 'Best Small Hotel 2006', gaining Silver in the 2007 national finals. Located about 12 miles north of Hexham.Converted from an 18th-century farmstead, Battlesteads is a stylish country inn with en suite rooms and an 80-seat restaurant. It is set in beautiful countryside close to the Roman Wall. The traditional inn retains a Northumbrian country atmosphere with beamed ceilings and cosy wood burning stove. A light and airy conservatory opens onto a patio and walled garden. Battlesteads is proud of its 'Green' credentials and has received a Gold Award from the Green Tourism Business Scheme. Set on the banks of the North Tyne, in an unrivalled setting overlooking Chester's Roman Bridge and Hadrian's Wall beyond, this friendly hotel is surrounded by beautiful gardens and spectacular walking routes. Priding itself on traditional 'northern hospitality', the George Hotel provides a relaxing environment with open fires, friendly staff and locally sourced and freshly prepared food. An on-site beauty and aromatherapist offers indulgent treatments (bookings required in advance). Just 5 miles from Hexham, voted Britain's most picturesque market town by Country Life magazine, the George boasts the perfect place to relax and enjoy a short break. Located about 6 miles from Hexham. Set in 1,000 acres of prime Northumberland forest and moorland, yet close to Newcastle. Surrounded by two championship golf courses, Slaley Hall remains a grand retreat and a symbol of Edwardian elegance. The Leisure Club and Health and Beauty Spa feature a 20 metre swimming pool, fully equipped gymnasium and spa. If you enjoy outdoor pursuits, Slaley Hall offers a variety of activities including fishing, archery, mountain biking, quad biking and hot air ballooning. 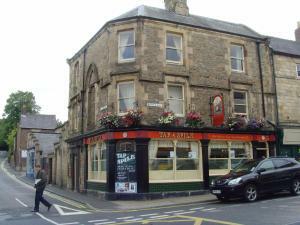 In Hexham's historical town centre, The Tap and Spile offers real ales, traditional rooms and full English breakfasts. The pub has a heated outdoor area and free Wi-Fi. Built in 1882, The Tap and Spile bed and breakfast has a traditional, cosy atmosphere, with open fireplaces and some original Victorian furniture. There are monthly folk music nights, and the large bedrooms feature TVs and traditional dÃ&COPY;cor. The Tap offers a large selection of real ales, as well as fine wines and fresh coffee. Homemade lunches are available daily, and breakfast is served until 10:30. Hadrian's Wall is within a 30-minute drive, and the 11th-century Hexham Abbey is a 2-minute walk away. Hexham Rail Station is a 10-minute walk away. Bed and breakfast near Hexham. Quality Accommodation in an ideal Location. Reasonable Rates. Warm welcome. For bed and breakfast accommodation in other areas nearby see Bed and breakfast in Consett Bed and breakfast in Newcastle upon Tyne.